You are here: Home � All Deals , Featured , Outdoors: Sports Travel Cameras � LifeSpan Fitness LS-5T Folding Treadmill for $399.99 shipped. 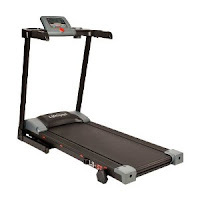 LifeSpan Fitness LS-5T Folding Treadmill for $399.99 shipped. Amazon.com is selling the LifeSpan Fitness LS-5T Folding Treadmill now for $399.99 shipped. The MSRP for this treadmill is $699.99. This treadmill is reviewed at four stars. The machine weighs 100 pounds. The speed range is 0.6 until 7.5 miles per hour. The LCD display on this unit displays speed, time, distance, calories, laps, and heart rate.